Ok, I've officially lost my macaron mojo. I've made three not-great batches lately. These ones are actually excellent in terms of flavor, but they didn't come out looking like I wanted. They got very frilly feet, and are flatter than my usual, and the shells are softer which is probably a good thing. I baked these a bit shorter than usual - 12 minutes rather than 15. Colorwise... well, I just can't seem to get the hang of that. These were supposed to be yellow and had a good amount of yellow food coloring in them but you can't see a trace of it in the baked cookies. Oh well! Anyway - I made them for Easter, and for Mac Attack 6! 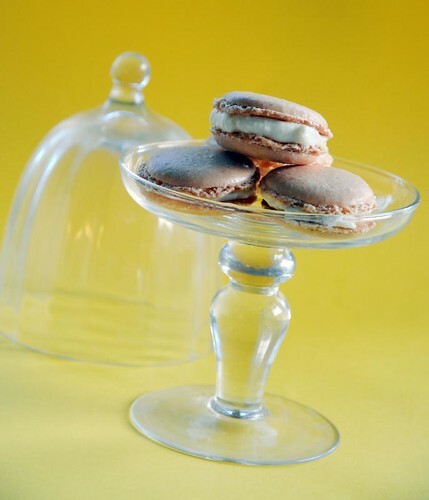 Head over to MacTweets to see a lot more - and much prettier - macarons. Beat all ingredients until it's really light and fluffy. If it seems too runny, place it in the fridge to firm up for a short while, before sandwiching between the macaron shells. they still look lovely and i am really liking the falvor idea in these! Oh Anne, we all go through this. I had 3 horrid batches, flat and cracked and 2 batches that had feet but were much flatter than usual. I think it's just a phase and anyway, if they taste good that is what's important, right? I still think yours look pretty darn good and I love the flavor! Thanks for sharing and baking with us at Mactweets! Hey no worries re: losing the mojo - I made two perfect batches first time round in Jan and Feb then in March it took me FIVE times to get it right then this time they worked on the first go. They are so unpredictable. These look lovely in my opinion!!! I do use paste colors (or well, gel ones, from Wilton) but I don't really get them to work. Maybe I don't dare add enough? I really need to get some powder colors instead. And I really wish I could find freeze-dried berries, as I'd love to make flavored shells. Hey, looks aren't everything ;) If I had a choice between lovely but so-so tastewise macs and delicious but uglier ones, I'd choose the latter. And yours are definitely not ugly! The filling is for keeps, def. will make it. Every now and then I look in on your blog and I always like what I see...but today I thougt, RIGHT-this time I am going to make them! I have not ever made Macarons, but have always wanted to. I think yours look devine - even though you don't seem to think so, but to me - a TOTAL macaron beginner, they look perfect and delicious! According to the English Press, cupcakes are so last year and Macarons are this year's thing - so with that in mind and your recipe, I'd better get started!! Great cheesecake macarons. They look very tasty. Yours look great Anne. You would weep if you hear of my mac mojo. After 8 attempts, it still never came back. I love your choice of flavours... refreshing and so different. Thanks for doing macs with us! Macarons are so finicky. Yours look pretty and it really is all about the taste.